First snow! And enough on the ground to play with! 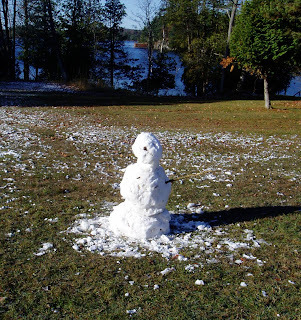 Josh and Joel took full advantage of the opportunity, creating the season's First Snowman. 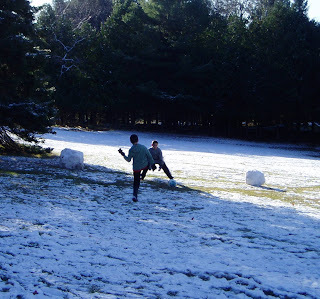 All that was lacking was a striped jersey and the Snowman could have served as the official referee for the soccer match that ensued. Check out the goalposts! Never mind, it will all melt - the forecast is for 16 degrees -- and we will get it all done! 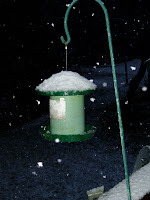 But it is a sure sign that it is time to start putting some seed in the birdfeeder -- which looked a little forlorn and lonely in the early dawn snowfall. Not that our birds are going hungry. We grow huge numbers of sunflowers in the garden each year, just for the birds. 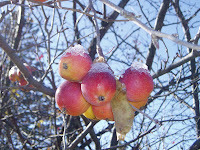 And there are still plenty of apples left on the crabapple trees. Looking, I must say, rather lovely with that touch of frosty snow! I have to put this on the blog, quick, before all the leaves fall off the trees. We've been busy getting the leaves off the lawns and mulched and ready to go back onto the gardens for the winter, and there are still plenty left on the trees so no doubt we'll get to do it all again before we're done. 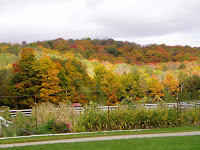 But this post is about changes in the weather, and as the leaves fall and the autumn nights lengthen, we know we are all in for some weather changes. This picture shows a tree with the leaves turned upside down. We call it "showing their petticoats" and trees do it before a change in the weather -- usually before rain. It's a better indicator of weather than most of the Weather Channel information! There's even a weather proverb for it: "Leaves turning silver a change will deliver. "That's because it is so closely related to the wind direction.In calm conditions or with the wind coming from its normal, fair-weather direction, the tops of leaves get the most sunlight and turn a darker green. When the wind shifts (a frequent indicator of stormy weather approaching) the leaves get turned the "wrong" way and show their lighter "silver" undersides. Even if rain doesn't arrive in your neck of the woods, the silver leaves at least mean that the wind has changed direction and/or increased speed. Up here in the Northern Hemisphere, the weather moves west to east, and storms rotate in a counter-clockwise direction. Knowing that can be useful! Another sure sign that there's a change in the wind comes with sundogs around the sun -- and while I always feel they should called moondogs when they are around the full moon, in fact they are called a halo around the moon. Sun dogs and moon halos are rainbows -- full circle rainbows -- and they indicated moisture in the air. Look for a drastic change in the weather within 12 - 24 hours. Of course, there's a weather proverb about the moon halo: When the moon is in her house, rain or snow will come. But not necessarily so -- if the weather has been really dreary, sundogs and moon halos still indicate a change, usually for the better! Taken in the spring, when the ice was just leaving the lakes, this is one of my favourite shots of a sundog around the setting sun. A friend of ours visiting from Germany, Bettina, nailed the shot. We live now isolated from the weather for the most part, but we really shouldn't be surprised by it. There are plenty of signs out there, from a change in the wind direction to a tree turning its leaves if we are looking for them. And plenty of weather lore and proverbs to help guide us! For 22 years, the weekend right after Thanksgiving has meant the Bala Cranberry Festival is in full swing. The whole town gets into the spirit of this, with vendors on the main street, entertainment, and tons of stuff to do. 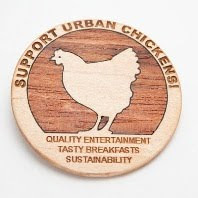 From tours of the marsh to the musicians, pancake breakfasts, juried craft shows, antique car displays, cranberry crepes and the chili cook-off, if you can't find something fun to do here, you are in serious need of therapy! There's even a town crier and a rubber duck race! The cranberries are coming in from the marshes, ready for you to tuck into the freezer and bring back out onto your table to remember summer! The biggest marsh is on the Wahta First Nations land. 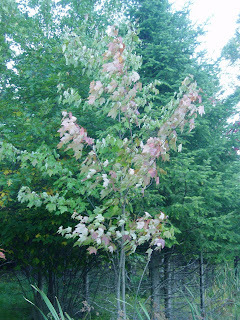 Wahta means "maple", and the name is taken from the abundance of maple trees on the land. The hot reds have burned out of the tree tops now -- the colours are more muted, with the golds, russet and brilliant yellow of the tamaracks starting to take over, but there is plenty of bright red colour at the cranberry festival! Last Tuesday Nancy was out on the lawn again, with a large group of guests, talking about stars, and owls, and the howls of wolves. She's been a (wait for it) 'howling success' for most of the summer, with the wolves answering almost every time, but Tuesday, under a huge full moon, there was no wolf song. "Oh well, leave your window open a bit. Perhaps they're hunting, and will howl later on." After all, what else can you say at a time like that? And sure enough, about an hour later, the entire wolf pack lit up with the most incredible display of wolf harmony. Close? Extremely. We figure they must have been down just past the hangar area. Libia and Mark were staying in Springside cottage, and had a 'ringside' seat for this performance. Perhaps they had been hunting, and couldn't stop to answer Nancy's call, or perhaps they were sleeping, or just on the move -- whatever, they did return the call, in their own fashion. 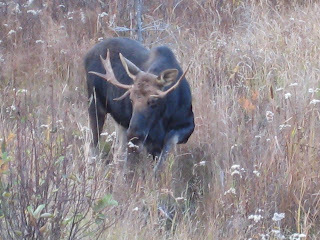 Over the next two days, they went hiking in Algonquin Park -- and scored not one, not two but THREE bull moose! Not to mention some great views from the Park's fabled hiking trails. There were no beaver at work when they stopped to look at the beaver lodges, however! 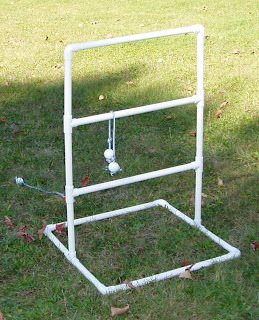 Bruce crafted this Ladder Golf target from pvc pipe, and set it up in front of the cottage. The idea is simple: two golf balls joined with a short length of rope; two targets. You stand by the first target and throw the balls to the second target -- it's much like horseshoes, really. The object is to get the balls to catch and wrap over the target bars. While it sounds easy written down like this, in practice it's akin to bringing down a fleeing antelope with a bolo... Evidently there is a knack. And evidently, I don't have it. 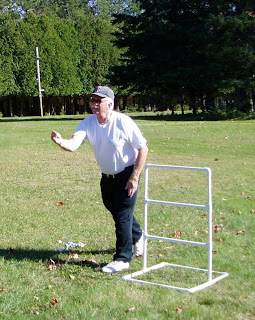 Bruce displays the kind of ladder golf form that will shoot him right up into the ranks of the Pro Tour. Madeline, a novice to the sport, also demonstrated a natural affinity and smooth wrist action. The great weekend weather got everybody out. 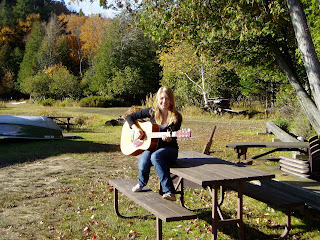 Alex took some time Saturday afternoon to both soak up some sun, and spread some music. She plays very well indeed, and the music could be softly heard all along the waterfront. Thanks for the concert Alex! When our grandfather, Joseph Tapley, arrived at Bondi in 1905, he named the farm for the famous beach in Sydney, Australia. Why? Well, he had just retired from a successful stage career in England, Australia and New Zealand in comic opera. And his arrival at Bondi pre-dates the construction of the dam at Baysville. 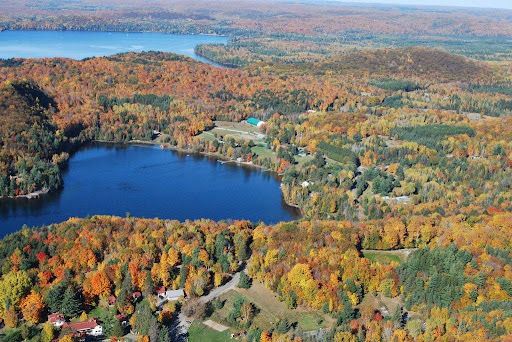 Lake of Bays has controlled water levels, because we are part of the water system that feeds into the hydro plant at Bracebridge. All this lovely water begins in the Algonquin Park watershed, flowing to us through Tea Lake and the Oxtongue River before heading south and west and eventually pouring into Georgian Bay. 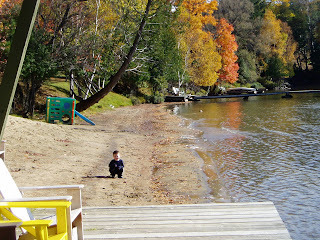 This fall, the water levels in the lake are very low. As a result, we've got beaches... stretching in all directions. 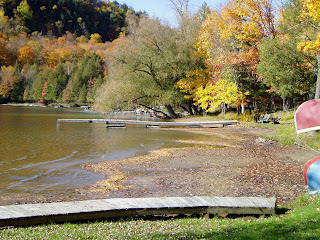 these pictures were taken from the Main dock, looking along the lakefront. 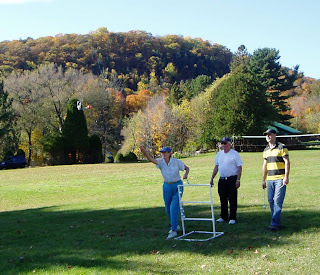 Over the Thanksgiving weekend, the warm weather drew folks outdoors. Some settled for playing in the sandpile, or just soaking up some sun with a cold drink. For others, the shallow water enticed a lot of people to hop into that lake one more time before they have to admit that summer is over. A lot of people will be driving around this weekend, admiring the colours and poking into shops and artists' studios. 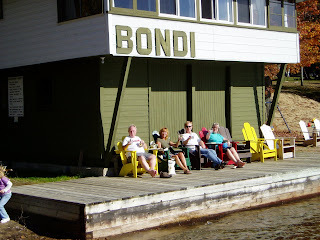 Baysville, the southernmost hamlet in the Lake of Bays, should definitely be on the list for THAT activity! There are two lovely little parkettes, designed, created and cared for by the Baysville Horticultural Society volunteers over the past 30 some years, and right by the river. From these parks, you can follow a walkway along the river's edge right down to the dam. Poke around in Rafter's -- Dave McPhee's fascinating home decor store built in one of the old village churches. It's stuffed to the rafters -- no pun intended -- with different, funky, unusual and just fabulous decorating ideas and products. 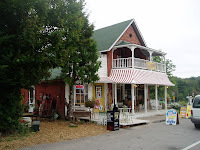 Next door, in the Bearfoot Gourmet, you can Savour Muskoka at their deli counter, prowl through their line of produce, and even pick up something for the evening meal. Miss Nelle's, on Bay Street, is a Must Visit. Don and Mardi had to wait until long time owner Nell Connelly reached her 100th birthday before she agreed to sell the old store to them. 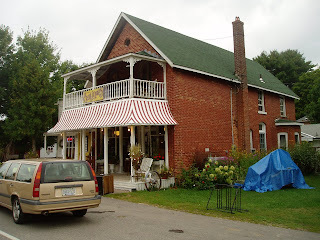 This is one of the first stores built in Baysville, the old Langmaid's General Store. Most of the original building is still there, with antiques and collectibles on two floors of the old house. Over the years, they've added an espresso bar and cafe, and during the summer season a Sunday Antique market and garden art tent. All year long, the cafe is a great place to stop for a coffee and a chat, a sandwich and an admiring look at the collection of 'things' on display. Nell would be pleased with how it's going... She began working as an employee of Langmaid's, and later purchased the store herself. Don and Mardi say they can still hear her high, shrill laough coming from upstairs, saying "All you have to do work all day, everyday!" It's a pretty darn good recipe for success in any field, Nell. Thanks for the tip! Dave and Mike are here for the Thanksgiving weekend -- Dave is enjoying the break from Georgian College, and Mike has been working for us on weekends, after working here for the summer. They are currently busy building a fence along the portion of the road that backs onto Red Pine and Longside cottages. We used to have a thick screen of cedar and pine trees along here, that provided an excellent buffer -- both visually and soundwise -- from the road. Over the years, with the increase in the number of deer here, that cedar buffer has thinned... and thinned... and thinned. The trees are all still there, all doing very well. Unfortunately, there are no branches for the bottom five feet or so of the tree, so all the 'buffer' is now up high. This looks lovely, but does little to fulfill the original purpose! And of course, as the buffer got thinner, the amount of traffic on the road got busier. Our solution is to put up this fence, at the far edge of the trees, where it won't be obvious and will blend in, which will cut any noise from the road and provide us with the privacy we were starting to lose along this portion of the property. It should be a win-win, as they say. 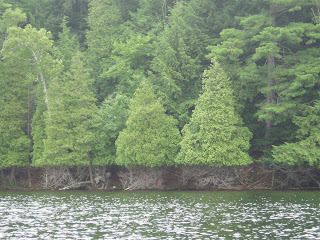 You can see the trimmed line on the trees all the way around the lake. Our guests frequently ask what causes this, and one dear soul asked Brian how long it took him to trim the bay, did he need a special boat to stand on for that, and was it necessary to use a cordless trimmer? The answer to all of the above is: No. It is simplicity itself. The line is the height of a deer standing on snow. The deer have eaten out much of the understory in our forests, due to the great number of deer currently hanging out around here. This is not the best thing for the forest, but it is certainly a bonanza for the local wolf pack. This pack has been in close all summer, providing us with some wonderful "howls" in the evenings. Lately, we've been seeing two young wolves who are not with the pack, for whatever reason. One of them appears to have mange -- and since Nancy is particulary unimpressed with having that on the property, she has been putting out medicated bait in the back field to clear it up. (The problem with that being that it is notoriously hard to get wolves to check their calendars and show up on time for medical appointments) These two young'uns have been seen frequently, and in close. One of them keeps showing up early in the morning, looking yearningly into the chicken coop (where the Bobs are all safely behind wolf-proof barricades). So today, when Mike ran into Nancy's office to tell her there was a young wolf up at the barn, watching the chickens, she didn't stop to inquire further -- off she shot, out of the house, past the garage, to the Bob Rescue! There is something magical about looking straight up into the treetops. 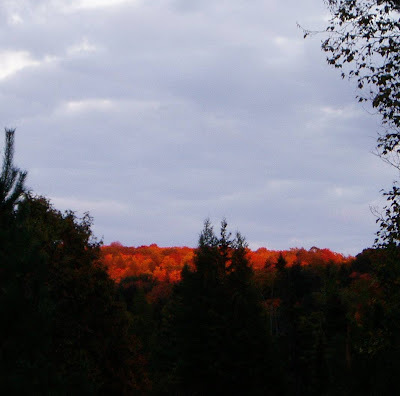 Especially now, when the treetops are so colourful. With the clouds behind, and the wind moving the branches, it is easy to get disoriented and almost feel that you are about to float up into those trees. One way to avoid this is to pull up a chair, like these on the deck at Springside cottage, and enjoy the views of the lake and the trees while sitting down! The long weekend is here, and with it some of the finest weather of the year. 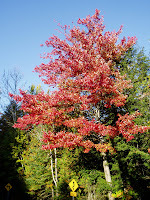 The colour could not be better, so it's a great excuse to get out there, and tour the Lake of Bays. 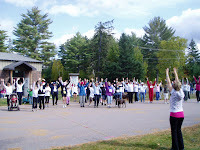 Start at the Oxtongue Craft Cabin. 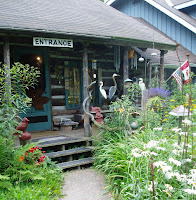 Jim's got the most wonderful collection of artwork and crafts from local artisans, beautifully set in a log cabin. You can probably scoop up ALL your Christmas list here, without even trying! In Dorset, the Tower offers a fantastic view. Last weekend there were so many visitors to this site that they had to close it down, and limit the number of people coming and going. There are 118 steps -- one of our guests counted them for me, so we hope you have a head for heights! If the tower isn't your thing, you can always hike to the top of our Lookout Trail -- it doesn't sway as much, and the view is just as wonderful! Pause at the Dorset Museum to see the new murals they installed this summer, and to take a peek at the exhibits. It is amazing how much change there has been in the past century, and this museum will whip you through it in a really fun way. No trip to Baysville could be complete (at least for us!) without stopping in at Miss Nelle's Antiques. This is one of the oldest houses in Baysville, and the architecture of the building is worth going to see. In addition to that, it houses a great collection of antiques and collectibles -- AND it doesn't stop there! Don's got a great little lunch counter there, with wonderful sandwiches, and great coffee (including the Lake of Bays Blend) and baked goodies. Sit for a spell, admiring the view of the dam. You can't dine at the old Lincoln Lodge (Wendigo) anymore, because sadly it burned last month -- which ends its long run of advertising that it was the best place to eat by a dam site. We think that honour now goes to Miss Nelles'! Come back along the South Portage Road, and pause at the municipal dock there to look at the Heritage Plaque celebrating the shortest commercial railway in the world -- the Portage Flyer, at one mile in length! Then work your way back here, and put your feet up, watch the deer -- or, since the weather is SO nice -- perhaps fit in that one last swim before winter! Over 150 people -- and quite a few dogs! 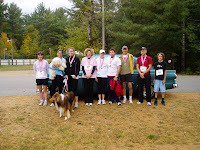 -- turned out for the annual CIBC Run for the Cure in Dwight this year. Nancy gets handed the microphone at this event, and does her best as MC to keep it rolling. She gets a lot of help from the volunteers, and the folks at CIBC and CBCF (Canadian Breast Cancer Foundation) who organize the run. And she gets a lot of help from the people who come out to jog or walk the 5 km. route. The route runs from the Community Centre along the front of Dwight, right next to the lake, and winds up to the top of Buttermilk Hill, just past the historic Stewart Memorial Church. It's a beautiful trail, and if you are in the area next year, you might want to write this into your calendar. 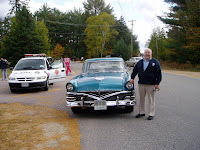 Ernie Martin came out to act as the Pace Car with his certified Chick Magnet, a 1956 Meteor 'Niagara'. Ernie used to race Meteors professionally, but couldn't bring himself to soup this one up for racing. He uses it, instead, to cruise, mainly at classic car shows. He did 'pick up a chick' on this drive, but since it was his daughter, we're not sure that counts, Ernie!! For a small community, Dwight does itself proud. With partipants joining in from Huntsville and the area, over $35,000 was raised to support Cancer Research. Nancy and Holly were up in the back fields this evening, just as the sun was dropping behind the far hill. While most of the fields were in shadow, there were still rays of sun hitting the far hillside, beyond the Hidden Lake, and lighting up the trees. It was too beautiful not to share! The back fields are full of wild berries, apple trees, hornbeam (ironwood), wild sage. This evening there were seven deer up there as well, including one of this year's fawns, still small but no longer spotted. During the winter, our cross country ski trails cut across these fields and drop down into the Hidden Lake, a black spruce bog that is not passable in the summertime without getting your feet very wet! The spruce bog is a haven for all sorts of animals -- and plants, such as sundew and pitcher plant, growing with the blueberries. We are fast approaching the Canadian Thanksgiving -- a holiday we personally think is much better situated in the calendar than its American counterpart. That holiday barely gives you time to finish up the leftovers before you're back into the turkey feast for Christmas! Ours comes at a time when autumn is at its finest. Fabulous colours, crisp nights and still warm days. A snap in the air, a touch of frost, perhaps northern lights in the night sky. It's a time to bring in the harvest, and be grateful for the bounty. To put gardens to bed for the winter, and start dreaming about next year's plantings. Autumn will give way to winter, with its own spectacular beauty, and winter will melt into spring flowers and running streams before we come back to summer. One of the great blessings of living in a temperate climate is that the seasons do change. I remember my dad stopping for gas on a vacation in Arizona. "Nice weather," he observed to the gas jockey, angling to open a conversation, "not a cloud in the sky." "Yep," replied that stalwart, "Sun. Same as yesterday, same as the day before, same every 'bleeping' day that ever happens..." Dad got back in the car. And we love the chance to decorate, with cornstalks and flowers, to bring out the scarecrows and pumpkins, and just have fun with the season. Huntsville's main street hosts a Scarecrow Competition, and Sandhill Nursery builds a straw maze in one of the greenhouses -- and looks ahead to Christmas with a fully decorated house. It seems everywhere you go, there are decorations celebrating the harvest. 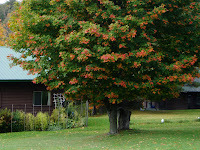 We still have one cottage open for the Thanksgiving weekend. 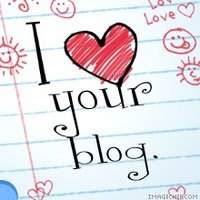 You should be here! Bob and Andrew are up for a family reunion in the big LODGE. 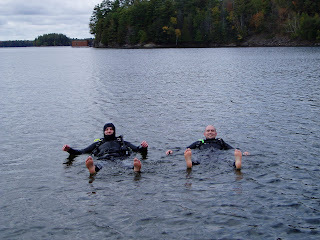 They recently completed their Dive Certification course, out of North Bay, and this week in Barrie picked up these snazzy new wet suits. They had a lot of fun bobbing about, despite the water being only about 15 degrees Celsius. There was a lot of splashing and laughing, and playing with the bouyancy. "To enter wild water is to cross a border. You pass the lake's edge and you break the surface of the water itself. In doing so, you move from one realm into another: a realm of freedom, adventure, magic and occasionally of danger" begins the introduction to Wild Swim. The experience is described as providing a frog's eye view of the world. Wild swimming, perfectly achieved in the lake here at Bondi, doesn't just promote literary endeavour: it is also good for you. According to NASA, who test this sort of thing, swimming in cold water lowers blood pressure and cholesterol, reduces fat disposition, inhibits blood clotting and increases fertility and libido. It also provives a natural high. 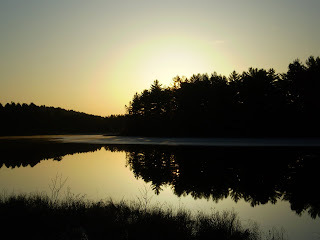 Mr. Start points out that "you get a complete buzz from swimming in rivers and lakes: however the world looks before you go in, it looks about ahundred times better when you get out." 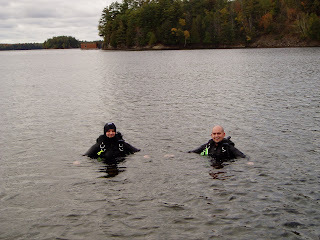 Not that Bob and Andrew were in any great hurry to get out, suited up like seals, and having a whale of a time. Nancy was over at Farside cottage last night, hooting for owls and howling for the wolves with some guests here from Germany. 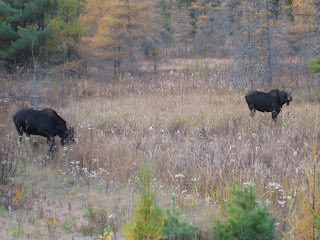 They had spent the day in Algonquin Park, and while they had really enjoyed the fall colours and the hiking, they had not seen any wildlife at all. Returning to the cottage, they were met by deer on the lawn. Nancy gave them a lesson in 'Canoeing 101' and off they went around the bay, having a great time. About 9.30, while both Canada and America were deep in debate for the coming elections, we all stepped out into the dark, to see who was close by. The whole pack opened up in song, somewhere over on the hill by the Sugarbush trail. They howled for us twice. Nancy and Achmed the Cat returned to her house, tripped lightly up the steps, and found a fluffy black and white striped tail sticking out of the dog food bag in the porch. Nancy tripped lightly right back down the steps. Mr. Skunk poked his sharp little nose out of the bag, and we looked at each other. Achmed wisely left. He was a good little skunk - he didn't spray, or make a mess, and given the invitation, he elected to simply leave the porch. All is good. We get skunks on the lawn at this time of year, usually at night, digging for grubs and leaving telltale little holes in the grass. They are actually rather sociable creatures, not aggressive, and quite willing to go through life without ever deploying their formidable scent glands, with a nifty liquid called "mercaptan." The trick is not to antagonize them. (or to be the sixth person to do so -- they can only make enough scent to spray five times a week...) Brian has it down to a fine science, if he catches one in the live-trap, and he can move the trap and still smell like a rose. He figures the stripes are really a Bar Code, identifying each skunk. You don't, however, really want to see them in the porch. Nancy recently attended a meeting on the Wahta Mohawk reserve, in their beautiful community building. This was the first time she's had the opportunity to be inside that structure -- not realizing that you can just drop by without having to attend a meeting there! Located on Hwy 38, just before you reach Bala, anyone traveling from Bondi to the Cranberry Festival on the Wahta land the weekend after Thanksgiving will pass this structure. Loosely designed after a traditional Iroquoian Longhouse, it is positioned on an east/west axis, typical of the longhouse orientations. 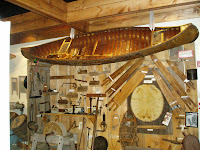 The long barreled roof represents the bowed poles in the bark covered structures, and a circular council room with a symbolic smoke hole also speaks to the Iroquois traditions. The floor features a design based on the motif of the Five Nations wampum belt in the central gallery and the Peace Tree motif in the multipurpose room. It is a truly lovely building. As part of the meeting, the "Singing Birds" performed a drum circle song for us, and Nancy met Shirley Hay, a Wahta Mohawk, whose native name is Tekahentakwa ( she who picks up the field). Shirley was a member of the Kanenhi:io Singers, a group of four ladies from different First Nations who have traveled the world, carrying the message of peace with their voices and their drums. Kanenhi:io means "the good seeds". 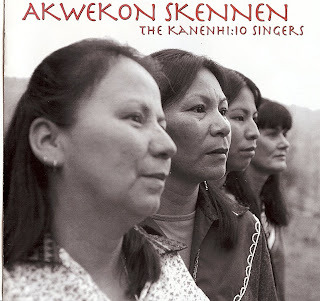 If you are at Wahta, drop by the Oka smokeshop (Oka means "another" -- there are 11 smokeshops on the Wahta land) and pick up a copy of their CD, Akwekon Skennen. 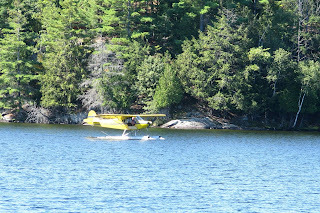 Syl stayed with us recently, and captured these pictures of Brian with his Piper PA-11 float plane. He titled them "Landing" and "Landed", but rightfully pointed out that no land was actually involved... Perhaps "Laking" and "Laked" would be more appropriate? 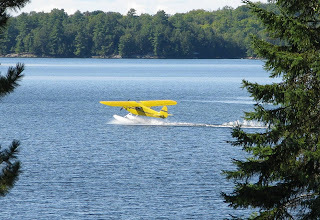 Float planes epitomize northern Ontario... the way the old Lake Steamers such as the SS Segwun (now operating out of Gravenhurst) epitomized the opening up of 'cottage country'. We are not a country of easy roadways and simple distances. We are a country (as the Arrogant Worms so correctly sing) of rocks and trees and trees and rocks and WATER! Brian, like his father before him, like all pilots of float planes everywhere, complains that he does not get enough time in the air. Partly that's being busy, and partly that is because you have to fly when the weather permits. These are not heavy aircraft that can power through the elements... Still, there is something hauntingly romantic about float planes, drifting down onto the lakes -- 'laking and laked' and speaking of the northern land and the beautiful freedom of the sky. 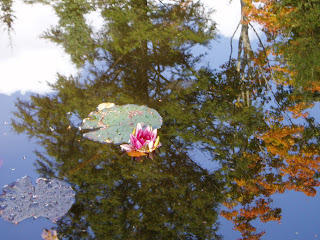 There is a small pond down by the hangar, en route to the Mountain Lookout Trail. It is a quiet, meditative spot (when not occupied by beavers, who do their best to flood the laneway). The edges of the pond are filled in with wild asters, pearly everlasting, bullrushes, sedges and other wetland flowers. The bucks come there to rub off the velvet on their antlers. Woodpeckers drop by to drill into the old stump at the water's edge. Ducks paddle about. Small fish jump, leaving the tiniest of ripples. Being quiet and protected, the surface acts like a mirror, untroubled by the wind on the lake, giving back the reflection of the trees and the sky until it is a 360 degree circle of colour. and the best part... the deer won't eat it... and it won't get touched by the frost! That was the tag line for the original Model T Ford. And ever since that first automobile rolled onto our roads, we've been fascinated by cars. Nancy was working in the laundry room once years back when she glanced out the window to see a brushed stainless steel Bricklin roll up to our little gas pump. THAT drew a crowd! Antique cars draw crowds. During the summer months, every Wednesday there is a Cruise Night for old car aficionados held in Huntsville. 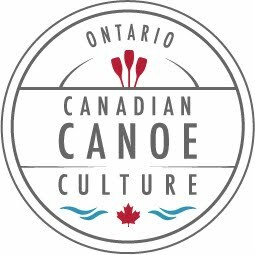 There are antique boat and car festivals held in Baysville, and Gravenhurst. And in the autumn, in conjunction with the local Fall Fair, there is an Antique and Classic car meet held in downtown Huntsville. Brian, Mike and Dave rolled in to this one -- but they didn't take Brian's classic Mercury to get there. The main street of the town shuts down for the cars, and there is more chrome and class on display than you'd think possible. Carol and Nancy were working in the garden this week, Carol weeding the flowers, and Nancy cutting cornstalks, when a pretty darn fancy plane came overhead. A Piper Navaho, it circled us once, then came back again, wing tilted, obviously having a good look. We waved, and wondered who was checking us out. Brian was in the air at the same time, with his own Piper Cub PA-11, a much smaller plane -- but in true Bushpilot tradition, a plane on floats. 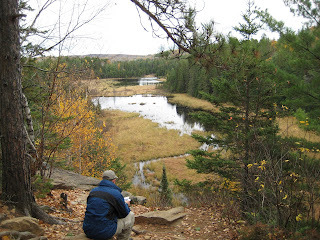 His mission was to take some photos of the fall colours, from an eagle's perspective. Later in the day, we received some photos by email, taken from the Navaho -- which turns out to belong to friends and long time resort guests Lyndsay and Ernie. Lyndsay's mom Pamela was in the plane, pointing out the window and locating all the things she remembered at Bondi from their visits here. She didn't see us waving back, sadly, but we probably looked like little ants from that height. Brian, upon landing, added his own photos to the day's collection -- and in the little picture, on the top right hand side, you can just make out a tiny little airplane -- that would be Pamela and Co. -- Brian was MUCH higher (but then, he wasn't trying to see us on the ground!) and was circling above their plane while they were circling above us, and the chickens were running in circles on the ground! 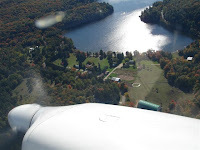 Seeing north Muskoka from the air, especially at this time of year, is a magical experience, and a breathtaking one. You don't truly appreciate the shape of the Canadian Shield and its myriad lakes until you see it from above!